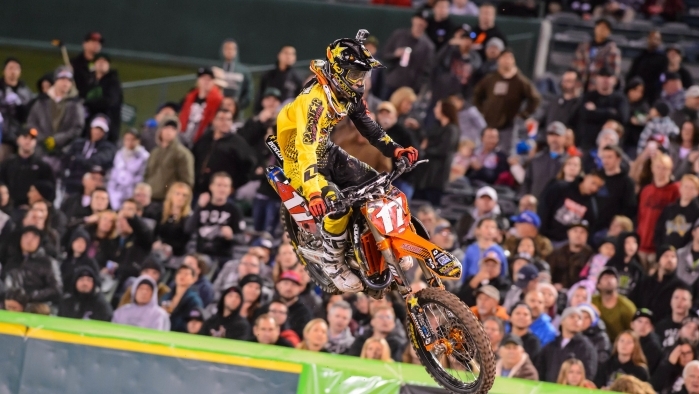 Aside from the 1st Anaheim in 2014, the city has not been very friendly to Rockstar Energy Racing's quest for the 250 West Championship with Jason Anderson. With the controversial cross flag penalty at A2, to the poor decision by Malcolm Stewart, taking himself and Jason to the ground after seemingly not even attempting to turn as he went straight into him at A3. Some may say team tactics were involved as Malcolm is the teammate of Anderson's closest competition in the points chase, Cole Seely. That is certainly a possibility, or it could just be the aggressive type of riding that is common in the fierce 250 class. If it wasn't for the adverse happenings in the West thus far, perhaps Jason Anderson would have a comfortable margin ahead of 2nd place overall. He was once again fast all day in practice and his heat race. Although it was the first heat of the year that he didn't win, he did come from the back of the pack to 2nd and nearly overtook the leader. In the main event, he once again didn't get out of the gate very well and some work to do. Anderson moved himself very quickly into the lead group and the top 5. He made a clean block pass with minimal contact to move by Stewart in the turn after the tough whoops section. Malcolm didn't see it that way however and he hit JA very hard in the next turn and sent him sprawling into the neighboring lane. Aggressive riding is certainly welcome in a sport where excitement and emotions are on an extreme high. However if it wasn't obvious enough that it is was a t-bone move as is, a good rule of thumb is that if you hit somebody and you both go down, it was dirty. The most impressive thing however aside from Jason's blistering pace each weekend has been his maturity through the bad moments. After the A2 incident, he just went to the track Monday morning and focused on Oakland. This weekend was no different. After he collected himself, he put on a clinic moving forward through the pack. Eyes were definitely focused on him as he found himself on Stewart's rear wheel once again. Anderson blew by him cleanly into 6th place. He doesn't have a need to worry about exacting revenge, his goal is only to win the title. By race's end he made his way to into 5th, falling just short of making one more pass on Justin Hill. After the race, Jason talked with Malcolm briefly but did not overreact or get angry. Racing is racing and he is still tied for the points lead. The kid is all grown up and a very good sport. Jason Anderson: "This weekend was alright, but tied in points now. Every time I get a cushion it seem like something just doesn't go my way. You know we're just gonna keep pushing, do what we do every weekend and come out battling next weekend." Ivan Tedesco made a big change prior to Anaheim 3. Just before Oakland, Team Owner Bobby Hewitt asked Ivan if he'd like to try and ride the KTM 350. Ivan agreed to give it a go. After going out for 5 laps, he was immediately more comfortable. By the end of the day, Tedesco wanted nothing more than to race the 350. He was so excited about it, he asked if one could be ready for the next race. Unfortunately there wasn't enough time to prepare, so he would have to wait until A3. There was no question to any one looking on that he was clearly better on the smaller bike. His corners more aggressive, attack position through the rhythm sections, scrubbing triples like a completely different rider. Ivan won multiple championships on 250's and is a smaller guy. It's evident that the 350 is perfect for him in the 450 class. Some people thought it was a contract deal that took IT off the 450 but they were wrong and the immediate results proved that. It is known by all on the team that he is much better in the main event than practice and that is by no means uncommon throughout the class. The second the gate dropped, the new Ivan emerged. Running with the lead pack he just missed out on qualifying directly out of his heat. That is a very tough feat, considering the level of competition and the fact that only 4 riders advance. He then rode stellar in his semi, putting himself into the main easily. He was stronger than he is been all season for the next 20 laps and the result showed just that. For the first time this season Tedesco found his way into the top ten. Everything is beginning to come together with the new bike, fitness and just being confident lining up at the gate. Chances are that the #9 will now be a consistent mainstay in the 5th – 10th range. Ivan Tedesco: "Not a bad day. I sucked once again in qualifying practice, I don't know why but I haven't been able to figure it out. I qualified 20th today and finished 10th so their was definitely some progress through the night. I'm a better racer than I am in practice so hopefully I can figure it out sooner and be better throughout the day. I'm going to keep working at it and hopefully finish better than 10th next week." Rockstar Energy Racing will now make the short trip to the final California round of the season in San Diego next weekend. Anderson will be eager to retake sole possession of the points lead where he finished on the podium one year ago. Tedesco will continue to adapt to the 350 and chop away at the gap separating him from the top ten overall. Davi Millsaps has also announced that he will begin riding February 10th and will get back to racing as soon as he can.